To hearken to His praise is fair and comely. Praise ye the Lord God. For He is mighty, and great is His power. He makes the grass grow high upon the mountains. And to the ravens when they cry unto Him. He taketh pleasure in all them that fear Him. Yea, from within His heart in highest heaven. That they may praise Thy name forever, Amen. Sein Lob is schön und lieblich anzuhören. Denn er ist mächtig und von groβen Kräften. Er läβt Gras wachsen hoch auf dürren Bergen. Den jungen Raben, die ihn tut anrufen. Er hat Gefalln an den’n, die auf ihn trauen. Daβ sie dein’n Namen ewig preisen, Amen. 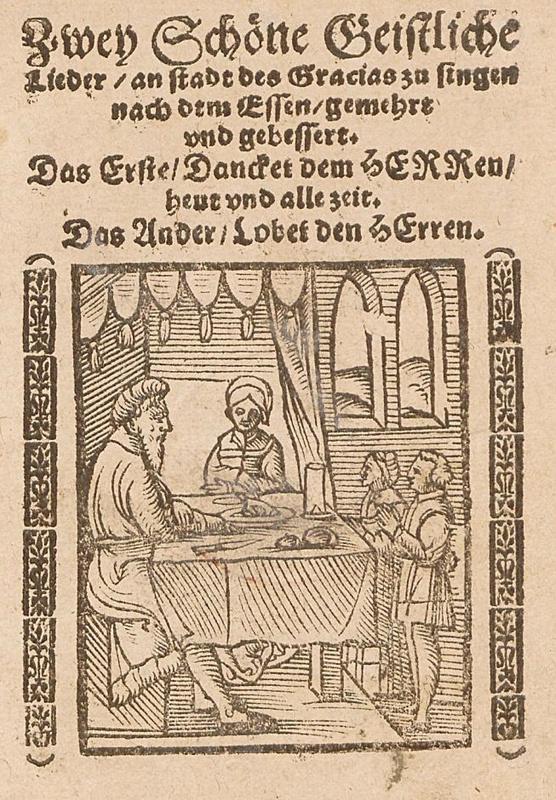 This non-rhyming metrical treatment of Psalm 147 first appeared with no melody in a leaflet printed in Nürnberg by Friedrich Gutknecht c. 1560, “Two lovely spiritual songs, to be sung after the meal in place of the Gracias.” A scan is available here courtesy of the Berlin State Library. The first song was Nikolaus Herman’s “Thank Ye the Lord Now and Always (Danket dem Herrn heut und allzeit).” The melody was provided in 1568 by Antonio Scandello, Kapellmeister in Dresden. The text has been newly translated for the Free Lutheran Chorale-Book. The music is the original setting by Antonio Scandello. Both text and music may be freely used and reproduced for any purpose whatever, and are offered with the prayer that they may serve for the joy and edification of Christians everywhere.